Jackie is an avid birdwatcher and photographer. As the owner and operator of Nature Explorers Anguilla, she conducts daily tours of Anguilla's 20 wildlife-rich wetlands where over 130 species of resident and migratory birds may be seen. Come Take a Walk on the Wild Side... with Nature Explorers Anguilla! All tours include pickup at your villa or hotel, use of our binoculars, spotting scope, bird guides and bottled water. Anguilla Shorelines and Offshore Cays: Anguilla is home to 33 pristine beaches and cays with a wide variety of shore and seabirds. Seven offshore cays including: Anguillita, Dog Island (IBA), Prickly Pear East and West (IBA), Scrub Island (IBA), Little Scrub Island and Sombrero (IBA), host a number of species of nesting seabirds, many with local, regional and/or global significance. Sombrero is the home of the endemic Sombrero Ground Lizard Ameiva corvina and the recently discovered Sombrero Dwarf Gecko Sphaerodactylus sp. Anguilla Wetlands: The mainland is dotted with 20 easily accessible wetlands that support both resident and migratory bird species. such as: Great, Snowy and Cattle Egret, Lesser and Greater Yellowlegs, Ruddy Turnstones, Semipalmated Sandpipers, Spotted Sandpipers, Least Sandpipers, Stilt Sandpipers, Willets, Whimbrels, Wilson's Plover, Semipalmated Plover, Snowy Plover, Black-bellied Plover, and Killdeer to name a few. Least Terns breed on many wetlands from April to August making them Important Bird Areas (IBA) . The “threatened” Lesser Antillean Iguana Iguana delicatissima is found here in small numbers. 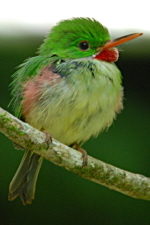 Birds of Interest: Caribbean specialties or birds of note- Five of the Lesser Antilles EBA Restricted Range Species including: Green-throated Carib Hummingbird, Antillean Crested Hummingbird, Caribbean Elaenia, Pearly-eyed Thrasher, and Lesser Antillean Bullfinch. Antillean Nighthawk, Bananaquit, Black-faced Grassquit, Caribbean Martin, Mangrove Cuckoo, Caribbean Coot, White-cheeked Pintail, Blue-winged Teal, Ruddy Duck, Wilson’s Plover, Semipalmated Plover, Snowy Plover. Anguilla Marine Parks: Five designated marine parks including: Dog Island, Prickly Pear Cays, Sandy Island, Little Bay and Shoal Bay extending to Island Harbour, provide a home to a number of species of endangered turtles, colorful reef fish and corals, sharks, migrating whales and dolphins. We look forward to assisting you with your nature adventure on Anguilla. Please contact us for more information.